Fancy yourself a mighty warrior, eh?! Think any fighter in the realm would tremble at the sight of you charging toward them in battle, possibly soiling their armor as they fled for safety? Aye, this could be the case, but there's one way to find out for sure. What kind of weapon do you wield in combat, "warrior"? 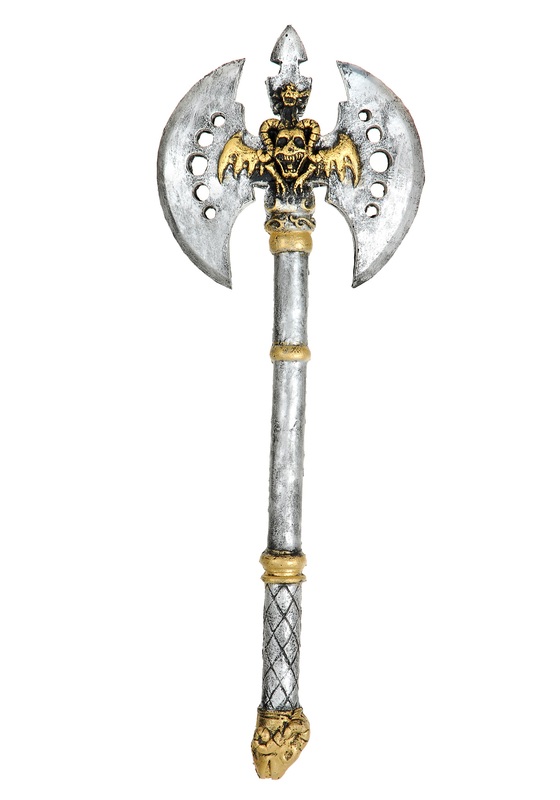 We ask because everyone knows that longswords, daggers, and bows are only for pretend warriors; while real masters of war use a mighty battleaxe to smite their foes! So, if you want to look like a real warrior next time you're LARP'ing or cosplaying as a true fighting force to be reckoned with, you best be wielding this Warlock Double Blade Axe! While it's true that this is not a real sharpened steel implement of melee warfare, the rigid foam construction and weathered metallic appearance makes it ideal for costumed adventures, in which you don't want to smite your foes!